The stratum corneum is fairly superficial, however and often can be seen sloughing off this mortal coil to travel the winds and bring new begins, sometimes good but often ill. Despite the fierce external forces that play upon these cells, the 15-30 layers stand this test of strength due to the super power of keratinization that prevents these forces from entering by ordinary means. When these trite actions do not suffice however, as is so often the case in hand and foot, the stratum lucidum comes into play. This flat layer keeps liquid out of the body through many dense lipid proteins called eleiden. After going this far down in the race, it is time for some wholesome stratum granulosum! But once filled up with granulosum that made the end to oh so many nuclei, we must proceed to the Stratum Spinosum! At the stratum spinosum is the joining together of cells through the great structure of the name Desmosomes which interlocks and strengthen the bonds between the cells throughout. Joined together, the stratum spinosum is the foe of many a foreign source or cell gone bad because of the interspersion of the mighty Langerhans cell. These Langerhans that fight intruders do so like their white knights companions in blood, as macrophages that engulf bacteria and other evil forces that plague the epidermis. As we near the end of this exhilarating race, we must come to where it all began – The Stratum Basale! None the less, this cuboidal-shaped stem cell is a precursor to much of the keratinocytes that make skin, skin; all from a single cellular layer. 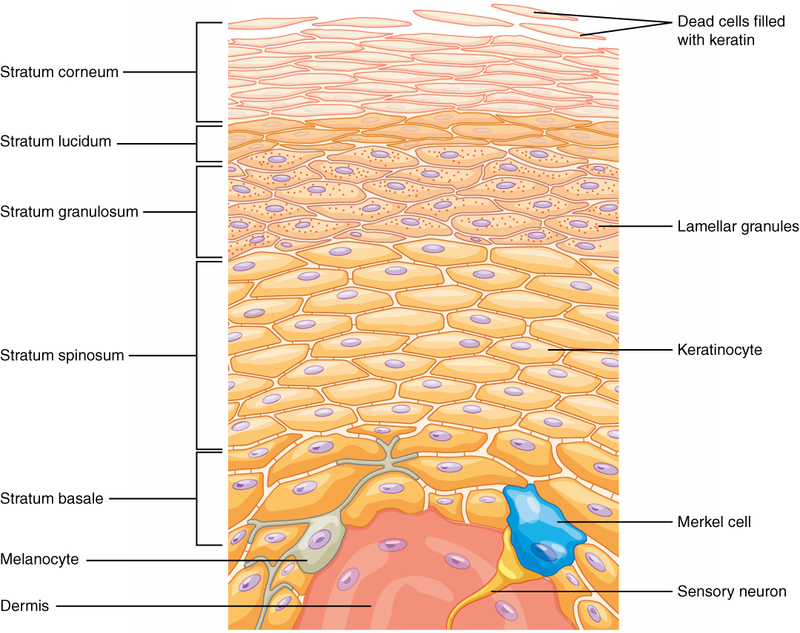 To add a little color to the layer, the melanocyte is used and also protects the integumentary system from the irradiating forces of UV light. And so, thus ends the race, at long last, where we may wind down our palpitating hearts by meandering though the basement membrane. The more numinous these pillars of support for the epidermis are, the stronger the connection is that binds the layers together, never to be forgotten. I was at Humanists’ Happy Hour at the Amherst Brewery and these were being passed out.